Ooredoo is the largest telecommunications company in Qatar and around the world, whose subscriber base has more than 114 million users. Ooredoo provides GSM-communication services for subscribers. That is why many terminators are paying close attention to it, assessing the possibility of installing GSM terminal equipment and the earnings, terminating international calls. 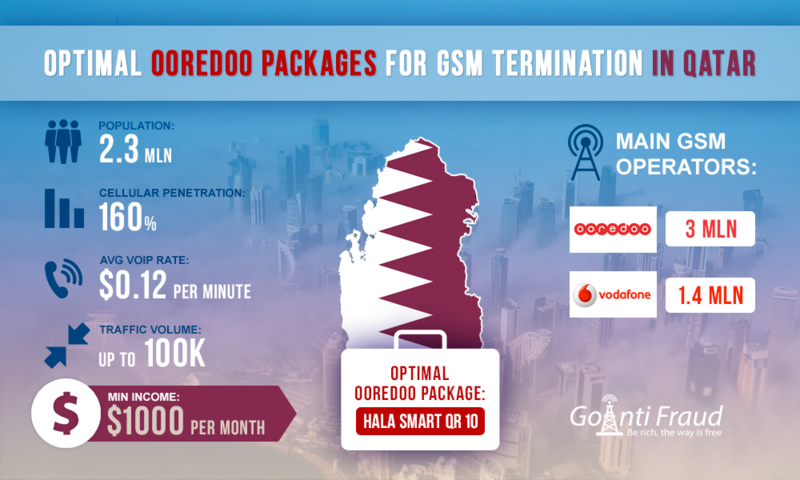 Ooredoo provides a range of packages for subscribers, the cheapest of which is Hala. It needs to be topped up for $ 2.75 to get the opportunity to make profitable calls domestically. However, this tariff plan is not fully prepaid. Hala Standard and Hala Smart provide improved conditions for termination. The former has to be topped up for $15.10, so that you can use the services as much as you want. However, the most popular among Ooredoo packages is Hala Smart. By purchasing a number, you must log in within 7 days of purchase and activate the SIM card by sending SMS with code 121 to the operator. Hala Smart includes 3 tariff plans - QR 10, QR 15, and QR 60. QR 10 is the most suitable for termination. By topping up $27.46, you can talk within the network without restriction for 7 days. QR 10 involves accrual of bonuses for the day after it is replenished. Want to start the GSM termination business in Qatar? We offer you NewBusiness package for beginners, which will ensure you have a successful start. The solution from GoAntiFraud includes the necessary VoIP equipment, tools to protect against the SIM-block, as well as software to computerize the operation and remote control over GSM gateways. This tariff plan is the most popular among visitors and tourists. Experienced terminators successfully use it, without fear that antifraud operator tracks and blocks the SIM-cards. The operator offers unlimited calls via packages, and is unlikely to be alerted by the constant communication within the network. Therefore, we can safely carry out call termination via Hala Smart QR 10. By the way, the transit companies are willing to buy the routs and land calls at $0.1309 per minute. The cost of one minute via Ooredoo package ranges from $2.157 to $0.393 per day. Since the above-mentioned tariff plans involve unlimited calls, termination can be carried out for 6-7 hours a day. Accordingly, the local call will cost from $0.002 to $0.0109 per minute. The difference, depending on the tariff plan you have selected, will amount to $0.12- $0.1289, will be what the terminator can make, terminating. Using Hala, Hala Standard, and Hala Smart, terminators can get an income of $1,300 a month per channel. When you install the multiport GoIP GSM VoIP equipment, this amount can be multiplied by the number of channels the device has. Your GSM termination business in Qatar can bring you more profits! Connect your equipment by EjoinTech & China Skyline, GoIP or Topex to GoAntiFraud to provide 100% productivity. You'll make more money as soon as the first months of work with the service.